Emailing is easy and powerful with the Tenant File. You can send to individuals or groups. You can create your own groups and save emails to them. This powerful screen is full of options and ways to email to your Owners, Properties, Units, Tenants, or Vendors. Just click on the 'Choose One' option at the top right and you'll see a complete listing of choices and email addresses for you to choose from. Here are some of the various ways to use this Easy Email screen. Vendors - create an invoice for your vendors. A vendor can be any individual or company that you set up in the unlimited vendors section of the Tenant File. That could include contractors, mortgage companies, insurance companies, or any customer that you need to invoice. You can insert the Vendor Name both in the subject and in the message of the invoice. Once you are finished creating the invoice, just click the 'Save This Email' button to save a copy for later. Owners - create a customized notice inserting the names of your Owners and their current balance. 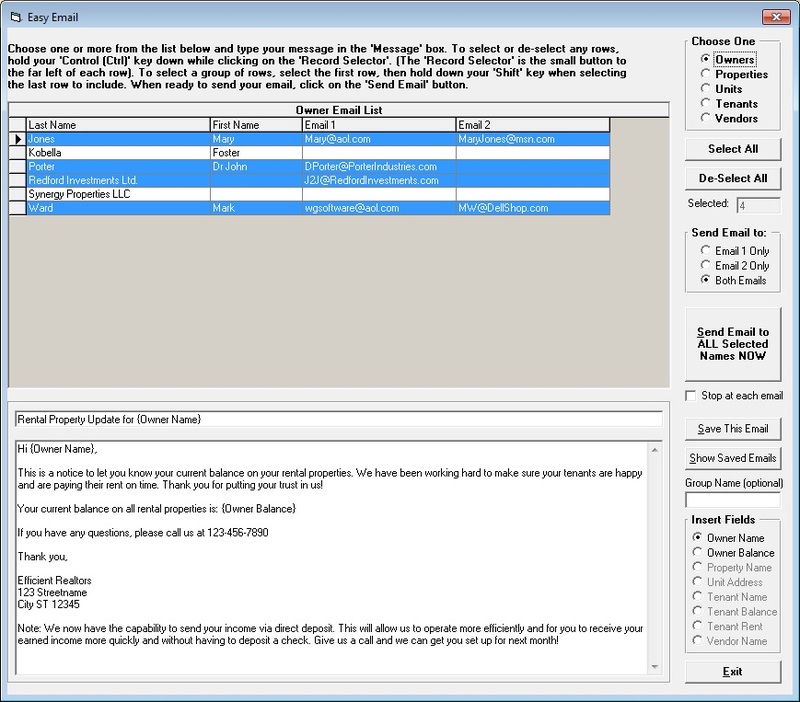 You can insert any message such as upcoming changes, thank you notes or billing notices. Just click and send. Tenants - create notifications of upcoming events, such as a freeze warning, watering schedules, or air filter replacement times. Maybe you could notify them of 'rent to purchase' options or create 'thank you for your business' letters. Create and save an invoice automatically inserting the Tenant Name and the Tenant current balance. You can also insert the tenant's rent payment amount into the email. The possibilities are unlimited for the emails that you can create and save. You can even create 'groups' such as a certain group of vendors or tenants that you want to save an email for. Also, you can choose to send to email address 1, address 2, or both. You have the option to pause at each email or to send them 'in mass' in just a few seconds. Compile an email list for mass emails to Tenants, Owners, or Vendors! The Tenant File will look in the program for email addresses that you have entered and compile them into a bulk mail format. Then you can call up you own browser and 'paste' the email addresses into a bulk email. It's easy! While this screen is primarily to remain compatible with older versions of the Tenant File, is can still be very handy in creating mass emails, such as an email that uses HTML formatting. This will compile a group of names that you can 'paste' into any email program to send multiple emails. One more way that the Tenant File is making it easier for you to expand your business.